In August 2011, researchers from the U.S. Department of Agriculture were presented with a serious, and potentially very costly, puzzle in Kennewick, Wash. 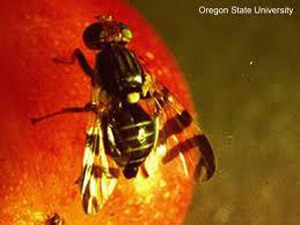 Since Kennewick lies within a region near the heart of Washington state’s $1.5 billion apple-growing region, an annual survey of fruit trees is performed by the Washington State Department of Agriculture (WSDA) to look for any invading insects. This time the surveyors discovered a crabapple tree that had been infested by a fruit fly that they couldn’t identify. It was possible that the fly’s larvae, eating away inside the crabapples as they grew toward adulthood, belonged to a relatively harmless species that had simply expanded its traditional diet. In that case, they posed little threat to the surrounding apple orchards in central Washington. As Feder and his team, including graduate student Gilbert St. Jean and AD&T research assistant professor Scott Egan, discuss in a new study in the Journal of Economic Entomology, the WSDA sent larvae samples to Wee Yee, research entomologist at the USDA’s Yakima Agricultural Research Laboratory in Wapato, Wash. One larva was sent to Notre Dame for genetic analysis. The study sought to compare Notre Dame’s genetic analysis to Yee’s visual identification after the larvae had developed into adults. Fortunately, the fly identified, Rhagoletis indifferens, is not known to infest apples. The Notre Dame group further demonstrated that it is possible to genetically identify the correct fly species within two days, compared to the four months required to raise and visually identify the fly. Originally published by Kirk Reinbold at news.nd.edu on March 21, 2013.